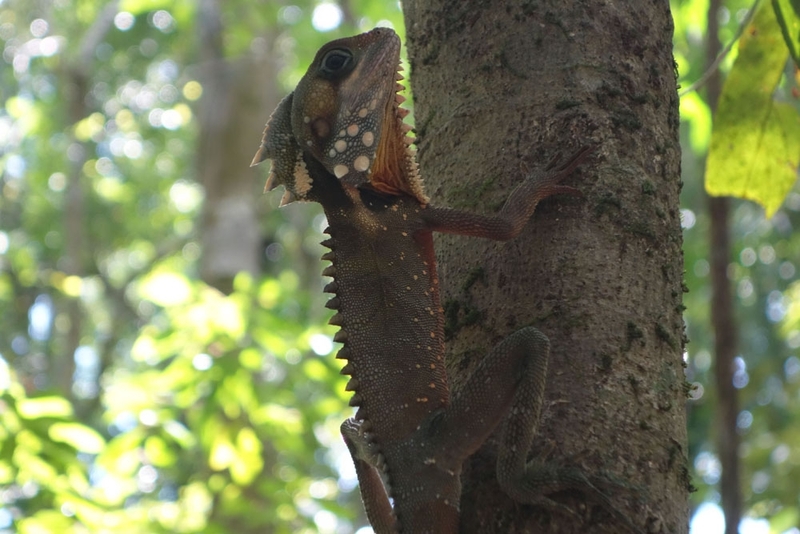 An enjoyable one day tour of Daintree Rainforest, Cape Tribulation and Mossman Gorge from Cairns with Cape Trib Connections and the wonderful George! After returning our Spaceship van at Cairns we still wanted to continue exploring further to the north of the east coast; namely seeing the Daintree Rainforest, Cape Tribulation and Mossman Gorge. There are a variety of tours that offer a very similar schedule going out of Cairns and I would venture that they are all pretty much the same in terms of the sights visited. We picked the Cape Trib Connections tour on a combination of it being one of the cheaper options at AUD119 (no point paying more for the same thing) and also on two different people having recommended it to us. You can pay more to get lunch included but at a price of around AUD15 per person, you are much better off bringing your own if you can. The thing that made the trip for us however was not the content, but the guide, George. In retrospect I would have almost paid to simply sit for the day and listen to him talking. Our tour of the East Coast of Australia has been somewhat lacking in exposure to the Aboriginal culture but sitting listening to George, who has a deep-rooted background in the area, reciting tales of mountains and waterfalls, giving glimpses of his family history and telling us about the various flora and fauna was amazing. 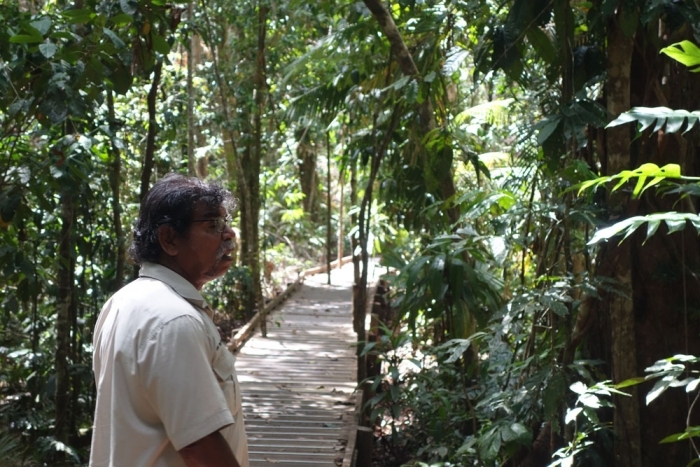 The first big stop on the tour (which picked us up from our accommodation in Cairns) was a boardwalk through Daintree Rainforest. George happily told us about the various plants and animals we encountered along the way. I get the impression that if you threw a stick in the forest he could not only tell you in detail about the thing you hit, but also about the stick itself and it's various medicinal properties. 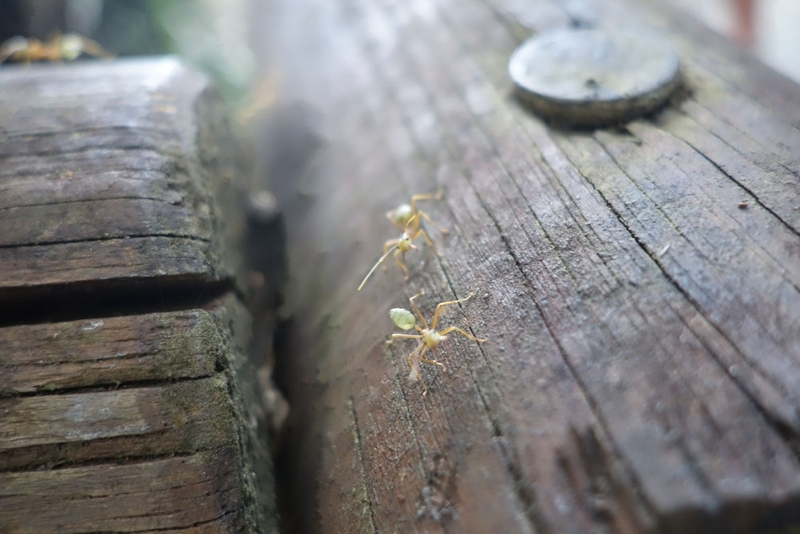 At one of the viewpoints we stopped at along the route we spotted a group of ants by the car park. For a few people on the tour George grabbed an ant so that they could lick it (non-biting end thankfully!) and discover they tasted of apple/lemonade. 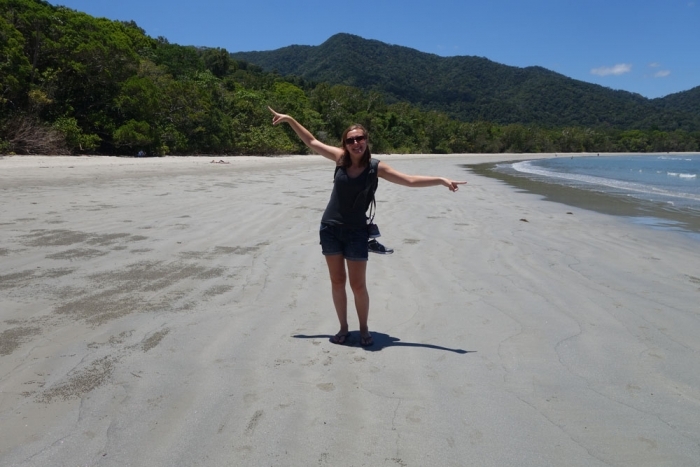 Next we headed for Cape Tribulation for lunch, where the rainforest meets the reef which is quite fun! It's a short beach so there is plenty of time to walk its length and back and still have time to grab lunch before you get back on the bus. On the way back from the cape we did a short river cruise looking for some wild crocs. 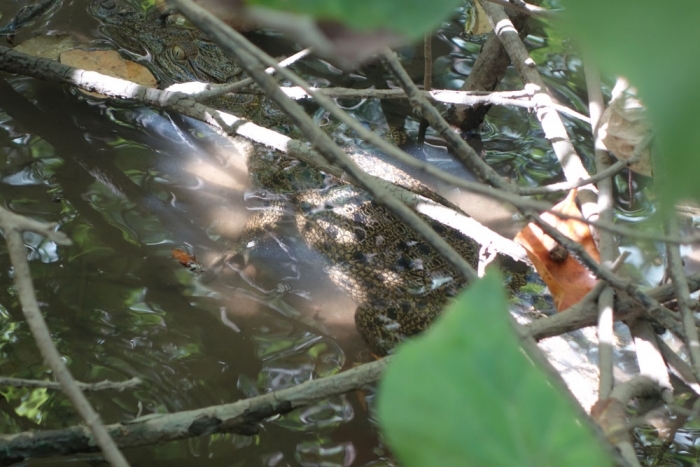 It was quite a short feeling segment of the journey and I would suspect many tours leave disappointed as it can be very hard to find anything but we were fortunate to spot a young crocodile along the river amongst mangrove roots. Still it wasn't the crocodile infested cruise that I had been possibly irrationally hoping for (although I think Lisa wasn't too disappointed that this was the case!). 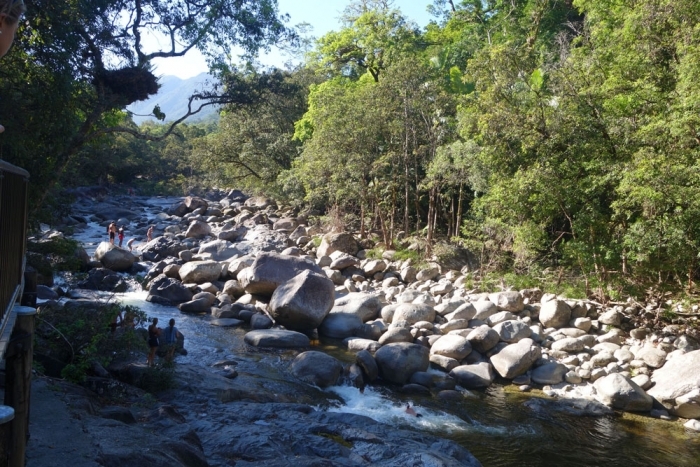 Our final big stop was Mossman Gorge and its clear water river. While some people were happy to simply lie in the sun and watch, you can jump in for a dip which we were up for! This was quite an interesting one to swim in (although a little deeper than some of the places we've swam before). The river is full of large slippery boulders so there is a little bit of swimming while trying to workout where the next boulder you can stand in is. We made our way upstream for a bit, swimming between Islands of boulders until we got cold (sun had dropped behind the trees), then headed back. Content with a good days adventure we headed back to the accommodation!